Challenge: Develop promotional materials that can be used for public relations and student recruitment for Westminster Conservatory of Music (Westminster), the community music school of Westminster College of the Arts of Rider University. Westminster wants to raise awareness of its programs and capabilities, publicize its locations, and build its enrollment by establishing a connection with orchestra, band, and choral directors at the region’s public and private schools. The Westminster staff prefers a press kit-style packet and wishes to emphasize and reinforce the Westminster value proposition: competitive, convenient, comprehensive, and affordable. Messaging is also very important to the conservatory. They have a distinguishing message to communicate explicitly to the music directors, as Westminster wants to be known as a partner and resource, and a place that enhances and expands on the musical experience that a student receives at school. Solution: Imbue and Westminster decided on a promotional kit that could be adjusted for different audiences by selecting any number of specific stand-alone inserts from a collection of six core pieces of marketing collateral. The collateral collection includes a cover letter, an overview brochure for teachers and music program directors, a biography template for the Westminster faculty, a poster for classroom use, a brochure for student and parent use, and a coupon that can be used toward tuition. It is hoped that the poster will hang in the classroom for a time and serve as a reminder of Westminster long after the kit is first delivered. The coupon is expected to work as an incentive for students to sign up for their first lesson. Collateral messaging primarily focuses on Westminster’s desire to be a partner of the music educator and highlights shared values, a love for music, the importance of music in a student’s life, and an affinity to help young musicians excel. These themes are reiterated throughout all the copy and emphasized on collateral covers as Your Community Music School and Your Partner in Music Education and Training. Outcome: The kit was presented to the Westminster Conservatory faculty shortly after production was completed. The overall design captured Westminster’s core visual identity and added a youthful slant as well. The kit was warmly received and placed into immediate use, just in time to communicate with the music directors as they meet new pupils and learn more about the students already enrolled in their music program. 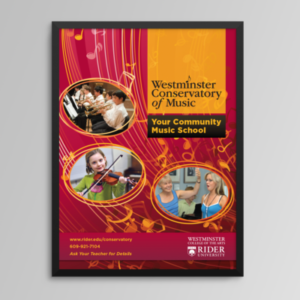 Westminster now has updated marketing collateral that can connect with a variety of audiences including a new generation of eager musicians.